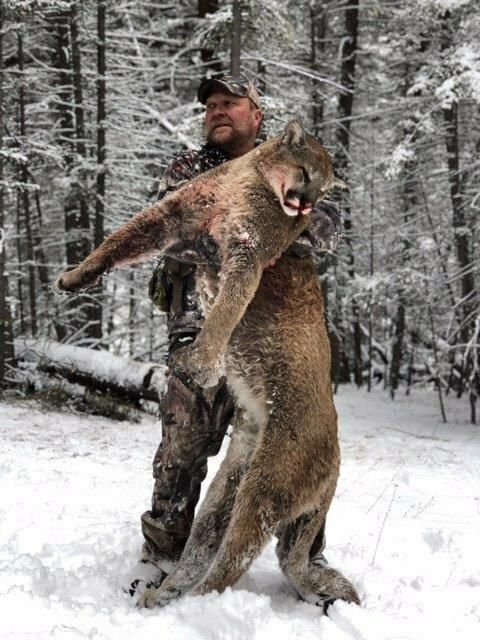 Chad Gochanour of Anaconda shot this mountain lion on Dec. 3, 2017, along Dry Cottonwood Creek near Warm Springs. Aidan Steber, 16, of East Helena, shot his first bull elk on the first day of the hunting season. Missoula photographer Dave Sidle shot this photo following a snowstorm on the northwest side of where the Lolo Peak fire burned. Missoula photographer Dave Sidle shot this photo of a deer herd on the east side of Mount Jumbo in a snow storm earlier this winter. Great Falls resident Rollie Strutz was 85 years old when he shot this bull elk on Oct. 27 while hunting in the Bull Mountains with his son, Kal.